Have you ever been involved in a citizen science bird survey? New Jersey Audubon conducts several every year: Shorebirds, Piedmont, Pinelands, Nightjar, Harbour Herons, and Grasslands. Pick one. Participating allows you and me to be part of something bigger. It lets the average John Q. (Or in the case, Jane) Birding-Public help collect large amounts of data on bird species across a wide geographic area. The Christmas Bird Count? Same thing. When the call went out this year for the participants for the Grasslands Bird survey, I signed up. As a group grassland birds are declining more than any other species. But through NJ’s Landowner Incentive Program that provides technical and financial assistance to private landowners interested in conversation, there is hope. Or at least we are hoping there is hope. That is what we are trying to find out. DJ Brown, Suzanne and I went to the mandatory training session, got our routes, street maps, aerial maps, forms to be completed, grassland bird call CDs and super official letters and car placards. The instructor reviewed the expected bird species, survey methodology, and answered questions. Honestly it has a little more rigor than I was thinking it would. I was thinking of it more as a drive in the country with a few stops, when in actuality, I am part of the control group. You heard me right, control group. Remember them? Holy flash back, shades of 9th grade science class. But, I also remember growing up to the bouncing call of Field Sparrows in the farm fields all around us; the flash of black and white as Bobolink leapt out of the grass and being curious about grasshoppers impaled on barbed wire. But I now live in NJ where suburban sprawl is eating up the grassland and the birds are disappearing. So I am doing my part in providing the science in the hope that someone else may have those same memories. My sister and I had just finished dragging the table and chairs out of the garage and uphill into the back yard and were enjoying our first sip and sup of well-deserved crisp white wine and creamy Saint Andre cheese when, from out of the corner of my ear; I heard it. I stopped chewy and tilted my head. “Weeza, weeza, weeza.” I saw a flicker of monochromatic movement. We both spoke at once. Not all warblers, the jewels of the treetops, are high or bright. The Black and White Warbler travels the trunk like a Nuthatch and has zebra stripes or so my littlest neighbor across the street tells me. I love that they are so accessible. Especially if I can see them in the backyard and the only travel involved is with a wine glass from table to lips. Belted Kingfishers stay with us all winter as long as there is open water. I saw them by the deep sluggish river when I was chasing after the Barnacle Goose and across an open reservoir when I was looking for winter Gulls. I usually hear the dry rattle of their call first. It amazes me that they can make it through the winter. Of the 3 kinds of Kingfishers in the US; I have only seen this one. sigh. I really need to get to south Texas. To see other great photos of birds, check out Birdfreak’s Bird Photography Weekly. Cardinals were everywhere at Brazos Bend State Park . I was seeing 10-15 at a time. They were in the shrubs, trees, bushes and on the ground. I’m tellin’ you there must have been a flock of 70 birds there. Often I would see movement, only to swing up my bins to see yet another Cardinal. By day 2 of birding the park, I was basically ignoring them-the cardinal sin. (cardinal, sin, get it.. hehehehe.) But you know what they say. “Bird every bird.” That means, do not assume, take for granted or otherwise be a lazy birder. Because you never know. In this case. Ain’t that the truth. I brushed past this guy with a shrug then a little alarm bell went off. “Wait, something is not right!” Turns out, it was So NOT a Cardinal. While it was not a life bird, it was the best look I have ever had of a Vermillion Flycatcher. Ohmmmm. I am one with the reed. Ohmmmm, I am one with the reed. Seriously. What are you looking at? I know you can’t see me. You got some sort of reed envy thing going on? You too can be one with the reed. Ohmmmmm. WE are one with the reed. Look at that tail! Let’s see–at the beach, in Texas, long wonky tail, must be a Boat-tailed Grackle. I can usually tell the difference between the Boat-tailed and Great-tailed Grackle not by size, and the tail of a Great-tailed Grackle is a crazy thing to behold, but by voice and habitat. The Boat-tailed Grackle is a beach-loving surfer dude (Ok, I made up the surfer dude part, but they are coastal). While the Great-tailed Grackle is more inland. Their ranges do overlap though. The real key for me as to which is which, is their voices. They could not be more different. The Boat-tailed Grackle has a pretty ringing sort of call (and will always remind me of Florida for some reason)while the Great-tailed Grackle’s voice is harsh and sounds like for all the world like crumpling a wad of paper. Seriously. Holy Crap! This water is COLD! This picture always cracks me up. 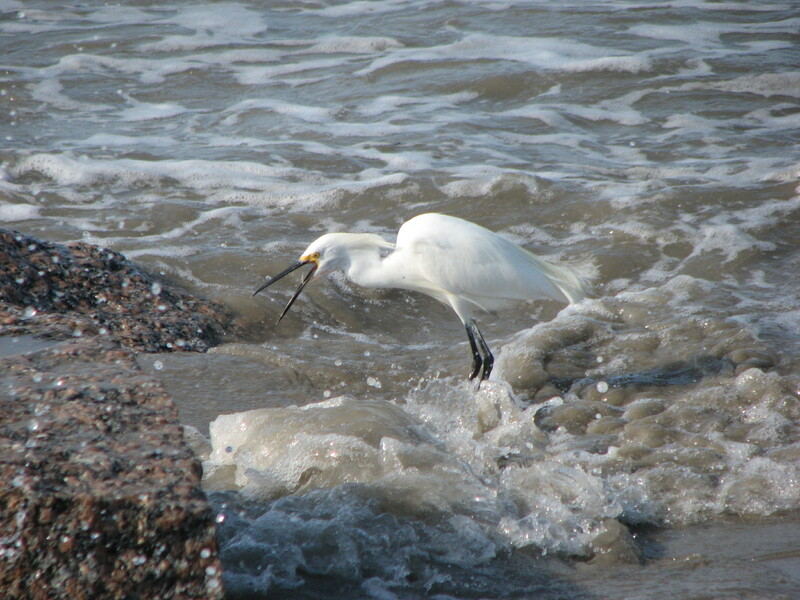 I spied this Snowy Egret on the Texas coast in May so the water was not terribly cold, but by the look on its face, it seems to be thinking it. Actually it was really windy and the surf was pretty rough that day. You can see the foam and the force of the water as it surges around the bird’s legs. To see other birds faces check out Bird Photography Weekly.